Mount Abu is the only hill station in Rajasthan. 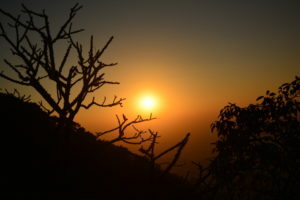 At an elevation of 1220 m/4000 ft, located on the border of Gujarat and Rajasthan, Mount Abu provides ample relief to the heat wave elsewhere in the state. Neighboring the desert, Mount Abu provides refreshing change in the landscape and provides amazing views of the valley of Aravalli Range. 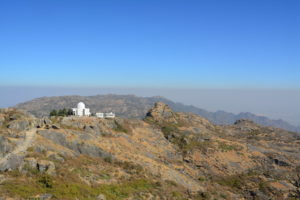 Due to the only hill station in the surroundings, Mount Abu is quite popular in the area, and the summers are filled with people from Rajasthan and Gujarat who come here to get a relief from the scotching heat in their own backyard! Apart from just providing relief to the heat, Mount Abu has several places where visitors can spend enough time to enjoy the nature. Mount Abu has various view points from where you can observe the Aravalli Ranges, a lake, several temples, sunset points and so on. 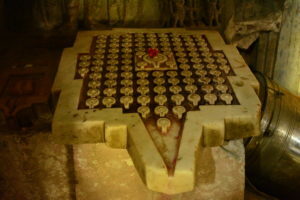 Dilwara Temples is a group of five jain temples located in Mount Abu. The temples were built during the 11 and 13 the centuries, and are famous for their use of marble and its carvings inside the temple. Very similar to the Ranakpur Jain Temple, the Dilwara Temples too have intricately carved ceilings, doors and pillars. Two of the five temples (named Vimal Vasahi and Pithalhar) are dedicated to the first Jain Thirtankara, Rishabha. The third temple Luna Vasahi is dedicated to the 22nd Jain Tirthankara, Neminatha. Fourth temple is dedicated to the 23rd Jain Tirthankara, Parshvanatha, and the last temple is dedicated to the last Jain Tirthankara, Mahavira. Each of these temples were built at different times by different people. The temples have undergone destruction few times in the past by various rulers, but was reconsecrated and repaired by several people at different times. Even during the repair, care was taken to retain and replicate the original work. Another place in Mount Abu where photography is prohibited. Peace park is a well maintained park by a charitable organisation.